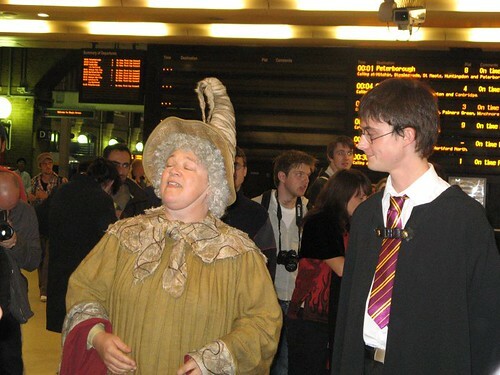 This was on the screen at King’s Cross. I didn’t get sick of watching it! The winners of the BBC competition. 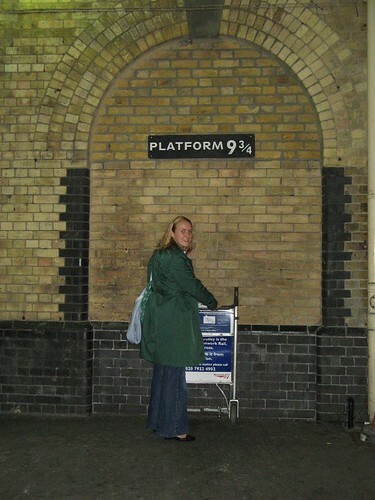 Then I headed into Kings Cross to grab a photo of Platform 9 3/4 before getting on the Tube to Angel, only silly me, there’s a WH Smith at the station and a queue starting to form. So I became number 33 in the queue. The press were out and about, with one reporter going around asking if anyone was English. I think maybe she was going for the English queuing angle. I’d actually just read on the BBC website before leaving home that they were having a hard time finding anyone English in the Waterstones queue as well (people started queuing there on Thursday morning!). 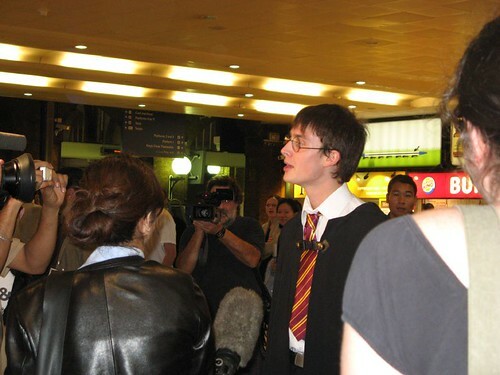 A gorgeous French guy (like, really REALLY gorgeous) dressed as Harry Potter came up to me, apologised for his English, and asked if I knew what the programme was. Unfortunately I couldn’t help him and he left! Stupid Sarah, that would have been the ideal time to start talking in French to the guy!! At 12:00:50, Professor Sprout led the countdown, and at 12:01 we were finally allowed through “Platform 9 3/4” (a hanging thingy they’d put up with a slit in the middle to walk through), grasp our copies of the book fresh from the boxes, and proceed to the checkouts with haste! And then block our ears as one of the obnoxious Australians made good on the promise to reveal the ending. Actually it’s really funny, but since I bought the book I’ve had more strangers in London talk to me than I have in the whole two months I’ve been here. On my way home a group of Gypsy (Roma?) women asked if they could look at it. Then in the patisserie this morning a couple asked if it was good. Then in the park a guy out with his family marvelled at how far through I was. 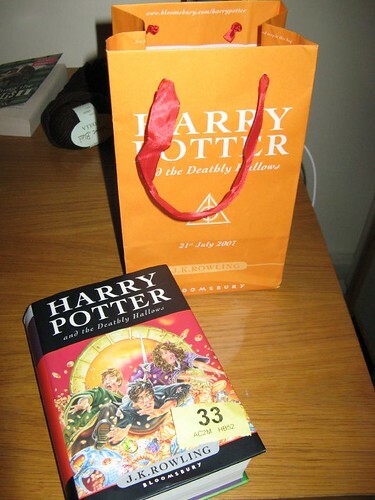 There really is something very magical about Harry Potter. I’ve made a new friend and all of these Londoners are actually talking to me! Loved it, by the way. Londoners (or those who can get here), who’s up for the Innocent Village Fete? Saturday or Sunday? I’m definitely going, just want to pick a day! ps knitters, there’s a knitting tent! Still on Harry Potter (and no doubt will be for some time leading up to and after next weekend). When I saw the film the other day I almost went nuts when I saw Grimmauld Place. 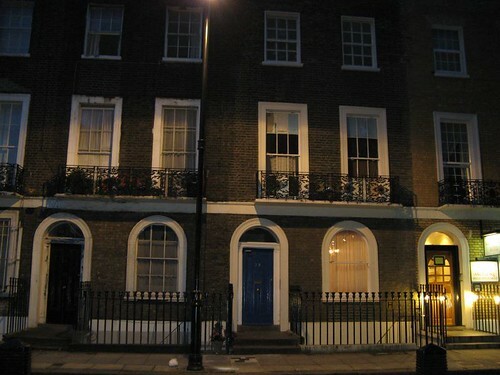 The style of the terraced houses was identical to the typical building style here in Bloomsbury. 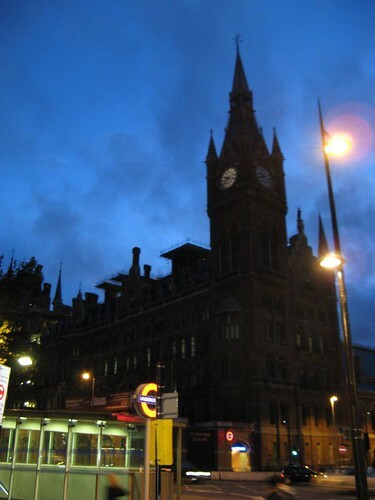 I was absolutely convinced I had seen Grimmauld Place before and that it must be somewhere near here! That would be borne out if the filming location chosen for Grimmauld Place is in reality close to Kings Cross, as it is in the story. So I did some internet searching and didn’t really turn up anything concrete, until I saw mention on a forum that Grimmauld Place shows up on Google Maps. How about that? You will recall that I live on the corner of Judd and Cromer, just a couple of blocks southwest of where Google Maps puts Grimmauld Place. I’ll have to wander over and take a photo someday soon.